Shields in Dark Souls III are an integral part of survival as you begin to understand enemy mechanics. As they are more than just a barrier used to distance yourself from imminent attacks, shields are widely avaiable in various sizes which allow a player to mesh their main-hand weapons into a personalized playstyle. With offensive applications in addition to their apparent defensive application, strategic use of the shield allows for more than simple damage reduction. Looted from a corpse next to the Pit of Hollows bonfire after defeating Curse-Rotted Greatwood. Dropped by the second hostile NPC after the first bonfire at Cathedral of the Deep. Looted off of Sirris' corpse after completing her questline. Starting equipment for the Herald class. Sold by Greirat after scavenging Undead Settlement. Sold by Greirat for 1000 souls. A chest in High Wall of Lothric. Can be found under a slug along the left wall just outside of the first Farron Keep bonfire. Dropped by Dark Spirit Longfinger Kirk in Cathedral of the Deep. Looted from a corpse near the first bonfire at Cathedral of the Deep a little bit uphill. Road of Sacrifices: From the Crucifixion Woods bonfire, drop down to the right of the large crab towards one of the large trees. Loot the corpse on the right side of the tree. On a corpse in an area above the Old Wolf of Farron bonfire. Sold by Greirat for 1500 souls after his first looting run. Purchased from Unbreakable Patches after defeating Deacons of the Deep. Looted from a dead corpse in the lake with a giant worm at Smouldering Lake. Dropped by Silver Knights in Anor Londo. Found in a chest in Lothric Castle. The shield is guarded by a Frost Knight, like the one fought before embarking on the Road of Sacrifices. Looted from Lion Knight Albert in Grand Archives. 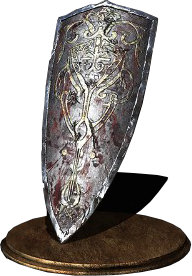 Drops from Pontiff Knights wielding this shield in Irithyll of the Boreal Valley. Trade an Undead Bone Shard to the Crow on top of Firelink Shrine. Buy from Shrine Handmaid for 500 souls. Dropped by Sage’s Prentice at Road of Sacrifices. Trade Pickle Pee the Crow a Mendicant's Staff. Dropped by Red-Eyed Skeletons wielding this Shield in the Catacombs of Carthus. Question here: Is it harder to parry with standard shields then it is to parry with Small Shields? When I hit a new game, I normally have an easy time parrying Iudex Gundyr with all the classes that have Small Shields. Last time I tried out the Herald, and with his Kite Shield I could not manage to land a succesful parry on Gundyr. Is it because Standard shields have less parry frames? It does make sense, because the Standard Shields are a bit larger and weigh more units, but I just want to be sure. Some veteran shield expert player that has an answer for me? I thank you kindly sir! :). What does the little round icon on the bottom left of some of the sheilds mean? I know the sword means the have "Weapon Skill", but the icon only shows up on some sheilds that can parry, not all. Is it possible to add columns displaying which shields can be infused and buffed(don&apos;t remember MS and GMS can be used on all shields or not, etc. ), and a column for how high the shield can be reinforced (up to +5 or +10)? Would it be possible to get a column for the buffs items give, for example, so people can see the quicker stamina recovery start on the Green Crest Shield? Please edit this page out, which shields parry and which activate a weapon art? We need to know!